DPAC is prominently located at the main entrance to Damansara Perdana, just off the Lebuhraya Damansara-Puchong (LDP), opposite PJ Trade Centre, nearby IKEA, The Curve and 1 Utama. After the LDP highway as you enter Damansara Perdana (there is a big signboard which says DAMANSARA PERDANA on your right), at the first traffic light , turn right and go along the road for about 800m. DPAC is on your right, opposite the PJ Trade Centre. Please park your car at either Entrance 1 (E1) which is beside the Qliq Hotel or Entrance 3 (E3) which is opposite PJ Trade Centre and proceed to our venue. Directions from Puchong: Heads toward Kepong on the LDP Highway, after pass by One Utama Shopping Mall, follow the lane of Damansara Perdana which is on the left. At the first traffic light, turn right. DPAC is 500m on the right. Direction from Klang: Heads toward Petaling Jaya on the NKVE highway, pass by two petrol stations which is Patronas and Shell , keep left and pass through Damansara plaza toll, after toll turn onto the flyover, then turn left, follow Kepong sign. 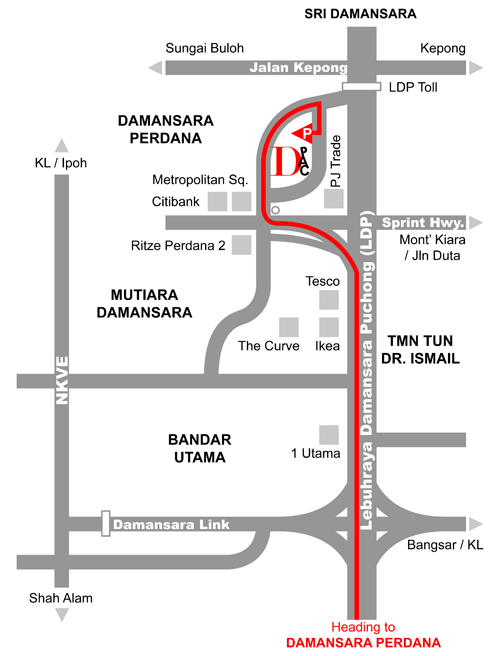 After pass by One Utama Shopping Mall, follow the lane of Damansara Perdana which is on the left. At the first traffic light, turn right. DPAC is 500m on the right. Directions from Kuala Lumpur: Heads toward kepong on the federal highway, pass by Midvalley Shopping Mall turn onto the flyover exit to the Sprint highway, follow Kepong sign. After pass by One Utama Shopping Mall, follow the lane of Damansara Perdana which is on the left. At the first traffic light, turn right. DPAC is 500m on the right. Direction from Kepong/ Bandar Utama: Heads toward Damansara Perdana, after pass through Lebuhraya Damansara-Puchong, LDP, follow Penchala Link lane, go under flyover, keep right. At the first traffic light, turn right. DPAC is 500m on the right. *Please search "Damansara Performing Arts Centre (DPAC)" at Waze / Foursquare / Google Map. For further inquiries, please contact car park management office (LG - pillar F23) at (+6)03 – 40650010 or Empire Damansara Management Office at (+6)03 – 40650070/1. 1) Take MRT to Mutiara Damansara Station and then take MRT bus no. T810 at IKEA (Timur), Persiaran Surian to PJ Trade Centre. We’re about a 5-minute walk from the station. 2) Take Putra LRT to Taman Bahagia Station, and then take a public cab to DPAC. We’re about a 15-minute (8km) drive away from the station. 3) Take Putra LRT to Kelana Jaya station and then take Rapid KL bus no. 802 / IKEA free shuttle bus to IKEA. After that, take MRT bus no. T810 at IKEA (Timur), Persiaran Surian to PJ Trade Centre. We’re about a 4-minute walk from the station. 4) Take KTM to Kepong Central Station and then change to bus Rapid KL bus no. 801 to Manhattan Business Hotel. Barely a five-minute walk to DPAC. 5) Take Rapid KL bus no. 800 from KL Sentral to One Utama Old Wing station and then take a public cab to DPAC. We’re about a 8-minute (3km) drive away from the station.